It's cold in my cube. Doods. I lost my famously ugly winter hat. Yeah, the one I got at Salvation Army in Kalamazoo, hand-knit by somebody's granny. The one John saved for me when I lost it at the pool hall. The one I expected to signal my existence if the creepy clown wants to find me. This hat. I've been having a hard time working without it. eBay was unable to help me at all. So I went to our favorite search engine which starts with a colorful letter G, and I was helpfully redirected to Etsy. I should have known. But these hats were cute, and expensive (read: more than $5.00; more than $10.00.) And I wasn't finding any that were two-sided....oh. I forgot to search "reversible." Boom. 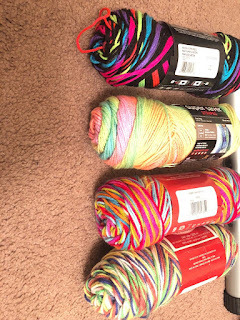 Michell of CrochetAndThingsCo is my Knitting Angel. Her hats weren't ugly, but they were brightly-coloured and double-thickness. She's in Wisconsin; she understands the bitter chill of Lake Effect winter (even if she's on the better side of it.) I chose two hats and placed my order; then I found one that might, by some standards, be considered uglier. Still not ugly. I wrote her and asked if I could swap out one of my purchases for the less-attractive snuggly-warm hat. 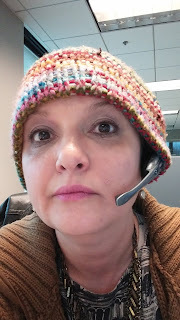 I went on, me being me, to explain how I'd lost my spectacularly ugly hat, and ask whether she'd make me a truly ugly hat if she could find some truly ugly variegated yarn. I sent her the picture up there ^^^ as an example of what I wanted. I damn near wept tears of joy at her willingness to shenanigate. I've asked her to use the top skein for one side of the hat, and the third one down for the other. Even if she didn't accept my commission request, I am eternally grateful that she knows how to make a decent stocking cap. Hats on to you, Michell. So I wanted this to be a surprise but last night I made the loud stripe hat (one side with the neon and the other side plain black) and sent it to you this morning with your order before you responded. You are already receiving it 😜 with the 2 other hats. It was supposed to be a surprise. I’m more than positive I found your yarn hat at the store and I found it in black too. I’m making each side the each color. I AM SO HAPPERY. Not only do I get a whole hat wardrobe, but also a partner in shenanigans. Here's the lesson I want you to take away: Never underestimate how important something is to someone, for example a second-hand hat. Your world is your world, and you build it the way you want it. Please FLOURISH. The first package is due to arrive mid-next week. I'll post pictures, peacock-proud. We'll have a Gorram hat-fashion show. I may even hire models. UPDATE: I kid you not, my original ugly hat was waiting at the pool hall for me, in the corner where the DJ usually sets up. I feel more blessed than you can truly grasp right now, I assure you. Just marinate on it for a bit. Get yourself a toasty-midwest-warm hat. Support small business. Michell and I thank you. You need to do at least some of your Christmas shopping here. You can get everything from soap with a razor blade in it to a custom cardboard cut-out of yourself. LOVE is what you wanted when even you aren't sure. OR, even better, when you are. Mari, that needs to be a t-shirt!